On this week's Any Given Sunday I will be talking about soccer parents and the harm they bring to the sport in North America. 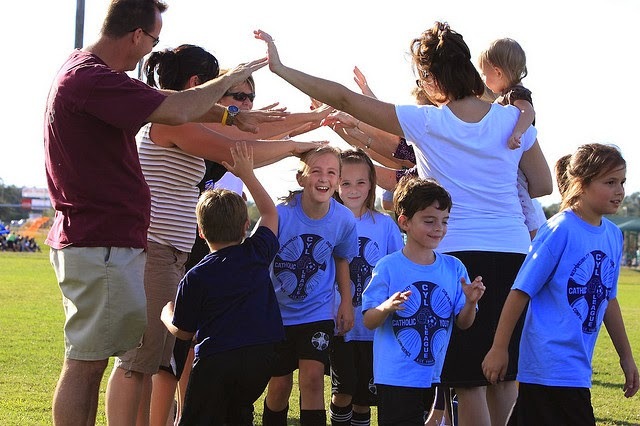 Many of us have children playing organized sports, most of us living in North America have decided to enroll them in soccer because it is a game we love and obviously would like our children to also find that same love for it that we did. At least I believe this is the original thought that goes through parents minds as they decide to walk up to their local soccer club and register their kids for their very first time in organized sports. How does it go from that feel good story to yelling and screaming on the sidelines because their child missed an open net is the conundrum of the issue at hand. Somewhere down the line that love for the game has been replaced with a competitive nature that in some ways will stifle the love that the child may have for the game which was the sole purpose why the parents enrolled them to begin with. So where does it go wrong? At what point it became about winning and not about enjoying the game itself and all the positives that come from it? I believe it is at the moment that the parent sees that his child has some ability and the setting changes from recreational to competitive, in other words when you transfer the player from house league to rep soccer. Suddenly the competitive nature in all of us takes over, and it becomes about two things: Being the best and winning. There is nothing wrong with striving for being the best at any thing you do, either be soccer, football, basketball or calculus, but that desire has to originally come from the child, and not forced on them by the parents need of succeeding through their offspring. The child has to want to be better at whatever they do, they need to have a desire to improve, seek knowledge, ask questions, learn, observe and then try to put in play all of the things that they have acquired from their environment, either be from the coaches, team mates, parents, friends or even from what they have seen on TV. If this learning process at the early ages is not fostered to be an organic growth and development, the risk of the child growing up and disliking the sport because it was never about fun and games and rather a military approach with no room for errors will be extremely high. The parents need to succeed comes from their social surroundings and how they evaluate themselves in the social hierarchy of the team that they belong in. They feel that the better their child is, the more accepted, revered and respected they will be amongst the other parents. It is a social case study for sure, since in that environment their job and income carries very little way to set the hierarchies of “power”, they feel that they can offset that by using their child’s ability as leverage to gain superiority over others. In the game of soccer this is the original driving force when we are talking about parent behavior on the sidelines either at practices or games; later as the players get older it becomes a dream of having their kid “making it”. Failing to realize that screaming at their child won’t make them a better player and will in fact create a riff between parent, child and sport. This brings me to the second factor that I mentioned above, winning. Winning is important, but not if it means winning at all costs and at the cost of a child’s enjoyment. Parents would not take away a Lego from a child because they are building it wrong, they would rather sit back, let them figure it out, have fun and then if the child asks for assistance, come in and help them with their project. Why should soccer development be any different? It shouldn't, we should treat a child’s soccer development with the same encouragement as we do any of their other activities. We can do that at the same time we teach them the importance of hard work, perseverance and winning. We also have to teach them about losing, because it is impossible to truly enjoy winning if you never tasted defeat. In life the lessons they learn from parents about winning and losing will prove to be helpful as they are faced with daily situations where they can come out winners or losers. How they deal with it will be the true test of a winner, and that can only be achieved with support from parents, educators and role models and not constant screaming demanding more and more from them, when we should just let them be who they are. Parents who behave like this should take a step back and ask themselves, how would I feel if every day at work someone would be screaming at them telling them to work harder and better? Telling them to wake up, play better or you won’t get lunch, or even telling them how horrible they are at their jobs. I am sure nobody would stay in a work environment like that; it would be considered bullying to a degree. So if we wouldn't like to happen to us, why should we do it to our children at their place of leisure? The answer is we shouldn't.